Jaspa: There’s been a definite space theme to the last couple of days. J: For those of you who don’t know, this is my brother Bisckits. He’s going to be ‘helping’ with today’s blog. 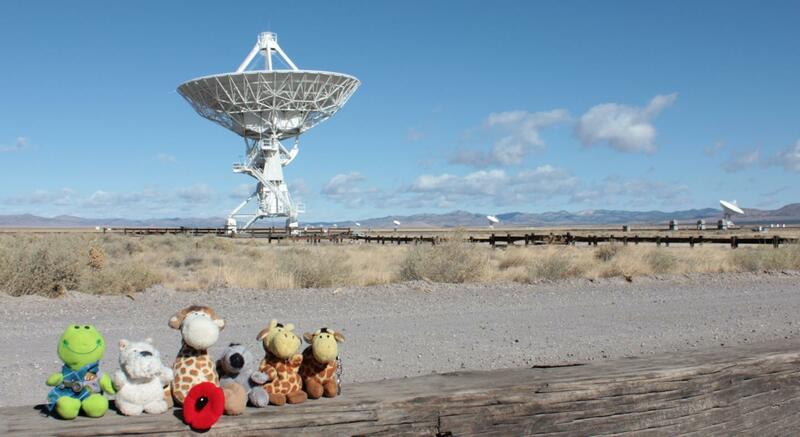 Sunday (which was Remembrance Day, by the way, so we were wearing our poppy with pride) began with a visit to the National Radio Astronomy Observatory’s Very Large Array. B: Oh yeah. That was amazing! J: It really was. Twenty-seven radio telescopes, each dish about 82 feet – or 25 meters – across, arranged in a massive ‘Y’ shape on a fossil lake bed in the mountains of New Mexico. B: It was bloomin’ cold, I know that much. J:You’re not wrong. I think the car’s thermometer said it was 27 °F, which Sue tells me is -3 °C. B: I thought it was always hot and sunny in New Mexico. J: Well, I guess we know better now. And anyway, it was really sunny. J: I said in a blog a couple of days ago that I love the place names in the Southwest USA. 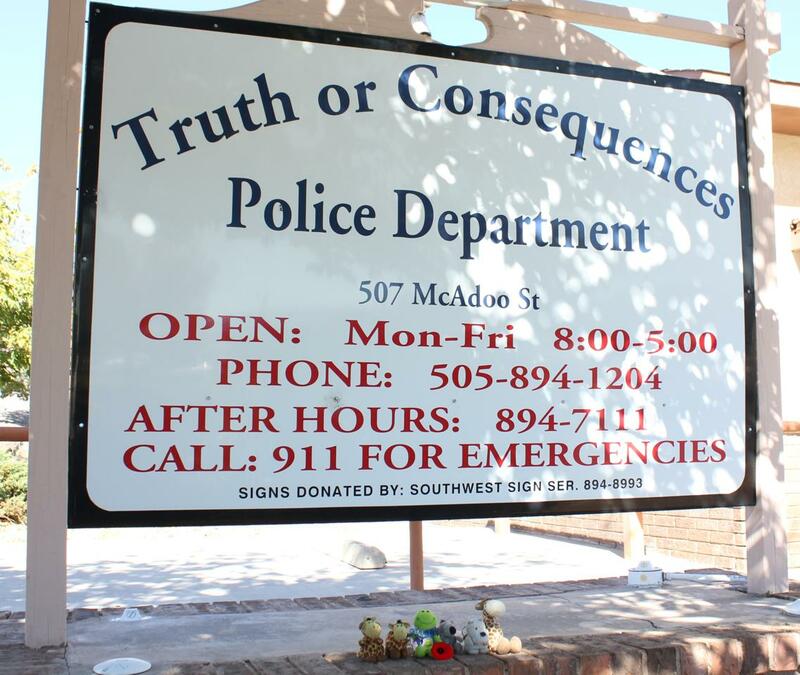 Well, I’ve got a new favourite: Truth or Consequences! B: Whatever. Can I tell them about…? J: Not yet, that comes later. First we’ve got to mention Hatch. B: That was the place with all the chilies, wasn’t it? J: That’s right… as our friend Jamie told us, it’s the Chile Capital of the World. B: Boy, was she right! 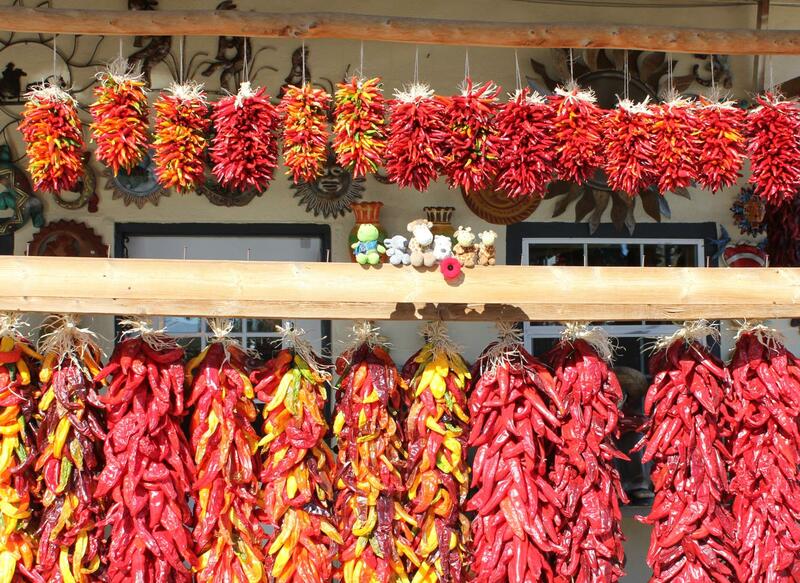 I’ve never seen so many chilies. J: Coming back to our space theme, an hour or so after Hatch, we passed through the White Sands Missile Range, where a lot of the testing was done that led to the rockets used in the Space Program. B: Space Program? Is it time for me to tell them about…? J: No Bisckits, not yet. First we have to talk about how we carried on to the White Sands National Monument to see the sand dunes that give their name to the whole area – which just happens to be another fossil lake bed, like at the VLA. J: I keep telling you, it’s the Very Large Array. The radio telescopes we saw earlier in the day. B: Oh yeah, I keep forgetting. J: Getting back to White Sands, it’s the world’s largest gypsum dune field. And the sand really is white. B: No kidding. It looked just like snow. 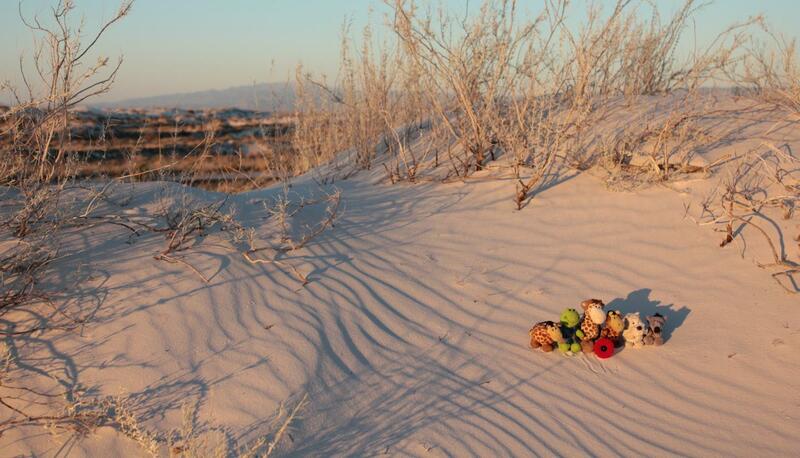 Especially at twilight when we were driving along those roads they’ve plowed through the dunes. 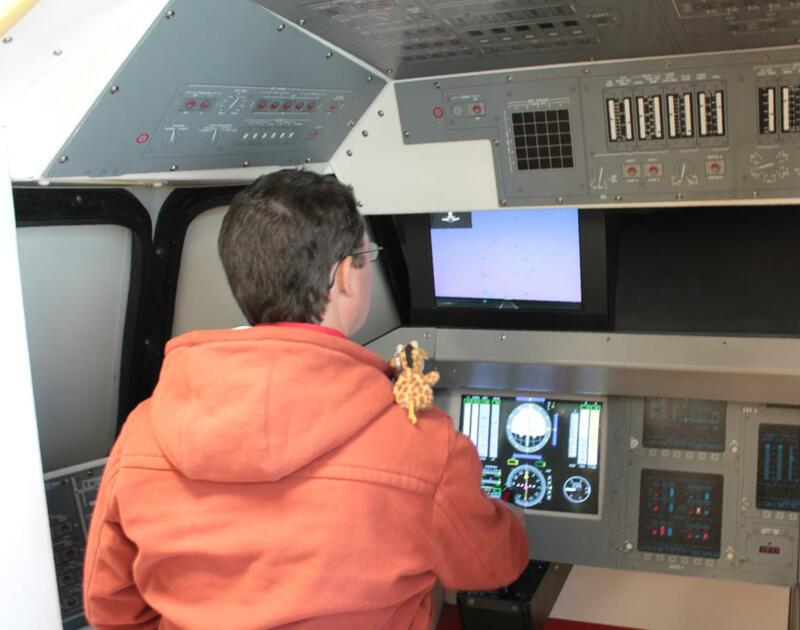 J: Yesterday morning – Monday – our day again started with a space theme, when we visited the International Space Hall of Fame in Alamogordo. B: Yeah, that was really cool. I’d like to be in there one day. Perhaps I can be the first Ses in space! J: Ha! I don’t think they make space suits small enough. Anyway, Portia reckons you spend enough time on your own planet as it is. B: Hey! 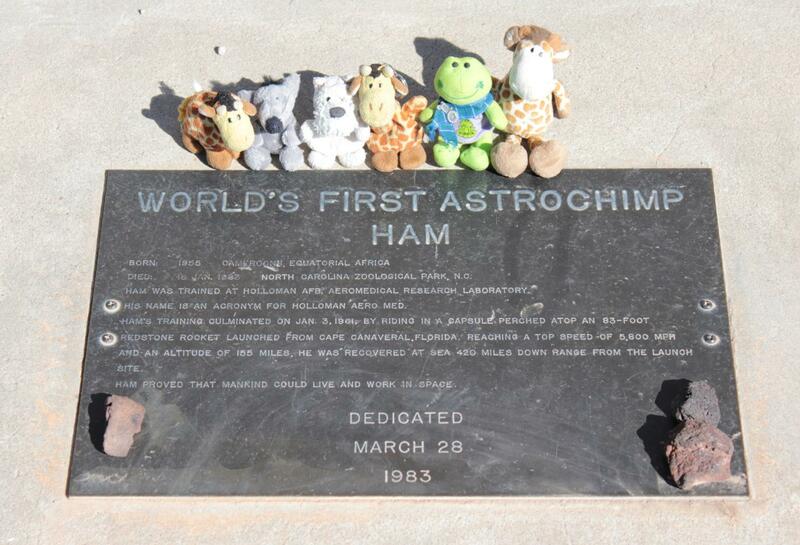 They made a spacesuit for Ham, the first chimp in space. J: Yes, but most humans don’t even know the Ses exist. How are they going to make you a space suit, if they don’t know you exist? B: I don’t think it’s fair. I think I’d make a good astronaut. Anyway, it must be time now? J: Time to change the subject, I think. 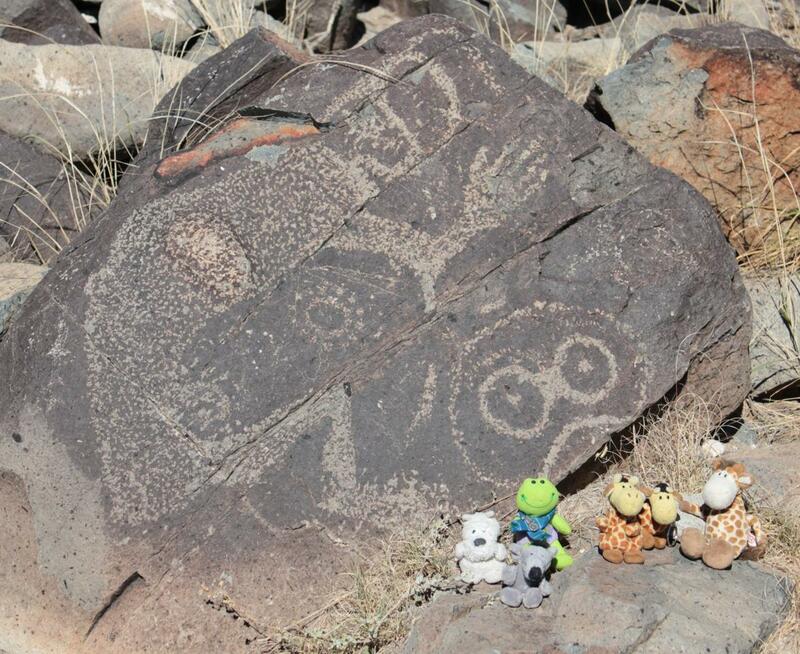 Next we went to the Three Rivers Petroglyphs Site. While we were there, I read there are something like 21,000 images carved into the surfaces of the rocks. B: The carvings of the animals were my favourites. Especially the one that looked like a giraffe. J: I’m not sure about that. If I remember rightly, the carvings are between 600 and 1100 years old. 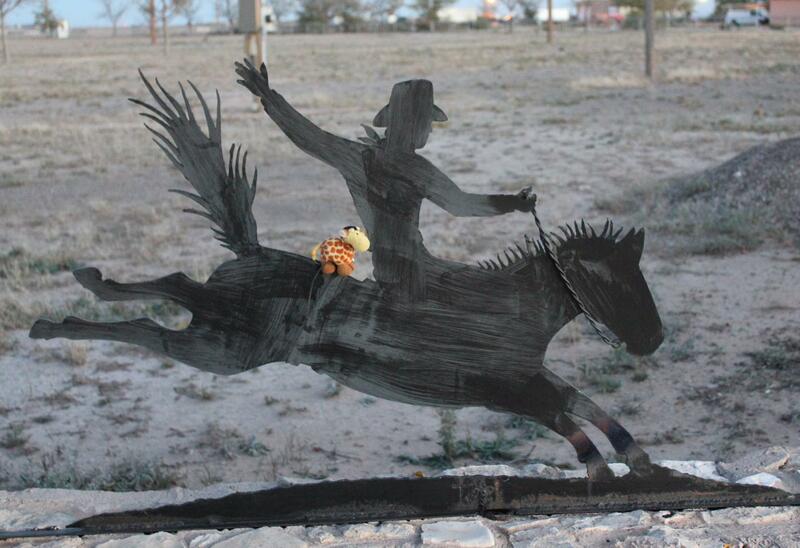 I don’t think anyone living in what is now New Mexico had even heard of a giraffe back then. B: Well, that’s just rude. 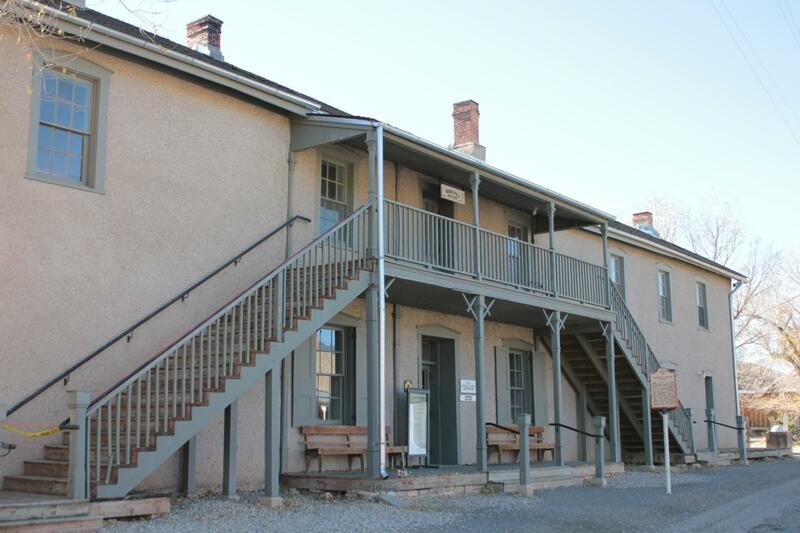 J: The next place we visited was the Old Lincoln County Courthouse that Billy the Kid once escaped from. B: I wish I’d been a cowboy! J: I thought you wanted to be an astronaut. B: I do… and on second thoughts, I don’t think I would have made a very good cowboy. Billy the Kid’s day sounds a bit too violent for me. B: It seems like almost all of the famous cowboys I’ve heard of ended up getting shot. J: Our last stop of the day took us back to our space theme… kind of. 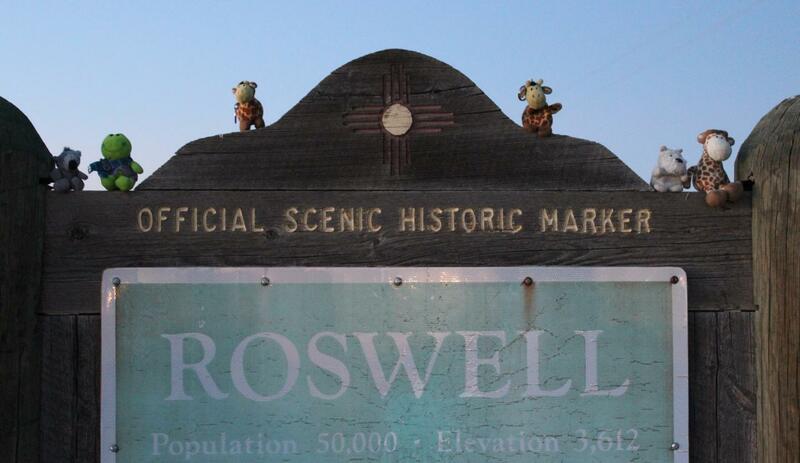 We visited Roswell, famous for being where an alien spacecraft supposedly crashed in 1947. B: Do you reckon it’s true? J: I reckon the Roswell bit is a bit misleading. The supposed crash site is 75 miles from there. B: Yeah, but do you think there really was a crash? 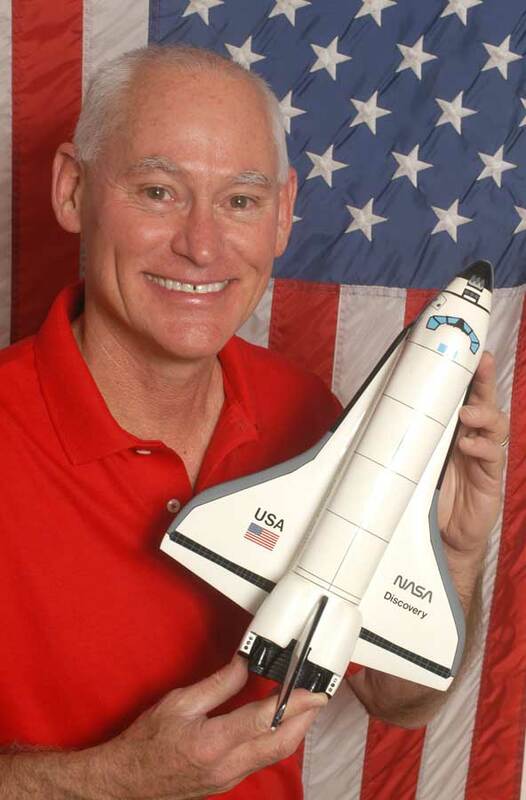 J: Time to tell everyone that when we stopped for dinner last night, a real live space shuttle astronaut called Mike Mullane – who’s picture we’d seen in the Space Hall of Fame earlier in the day – just happened to be sitting at the table behind us. B: Oh Jaspa! You promised I could say that! PS. 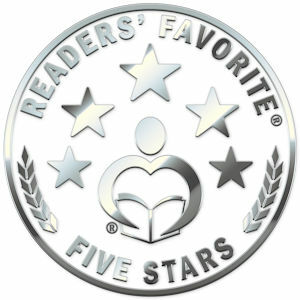 If you’ve never heard of the Ses before, visit my website to find out! This entry was posted in Travel, USA and tagged Adventure, Alamogordo, astrochimp, astronaut, Billy the Kid, Children's books, Children's literature, Chili Capital of the World, environment, first chimp in space, giraffe, Ham, Hatch, International Space Hall of Fame, Jaspa, Jaspa's Journey, Mike Mullane, National Radio Astronomy Observatory, New Mexico, Old Lincoln County Courthouse, photography, Roswell, Serengeti, ses, space, space program, Space Shuttle, Tanzania, The Great Migration, The Pride of London, Three Rivers Petroglyphs Site, travel, Truth or Consequences, Very Large Array, VLA, weather, White Sands Missile Range, White Sands National Monument, William H Bonney, writing. Bookmark the permalink.